小斯, 如果主卡同附屬卡各自於當月都做左Payme增值 HK$5000, 即總數HK$10,000, avios 會有1,667? Hi, is that the promotions for $12,000 for 8,000 avoid ended? Would it be available soon? 另外我想問一下 假如我去日本乘坐國泰航空 本身機票那些飛行里數儲楊avois 比較好還是儲回asia miles比較好? 小斯, 點解我登入左BA ACCOUNT, 想SEARCH下啲機位, 無論係台北定札幌, 佢永遠話ERROR, 話可能無果個日期, 或者無果個目的地, 揀左唔同日子都係咁. 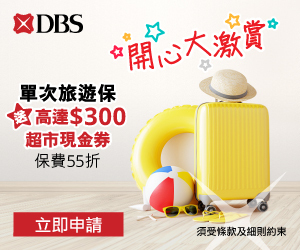 想問其實大新BA 迎新簽$6000 有4000 Avios 定係有6000 avios? 我已有大新信用卡, 所以我要叫我朋友申請BA呢張卡 (攞迎新), 同時開埋個Executive Club A/C, 之後係唔係叫佢加我個名係Family and Friends嗰list度, 我就可以將係dbs換既Avios轉入佢戶口度? 係咪張信用卡申請自動增值, 然後每日過500 去OEPAY ACCOUNT, 夠迎新簽帳額後再逐D入返八達通卡到用? 我剛問大新,佢話 八達通自動增值應該計迎新,可否幫手 clarify . thanks !! 但3月仲有大約十萬要簽; 想問下應該申請DBS blackworld 簽埋AM迎新好 or 轉申請大新簽avios迎新好? 請問網上買機票, book hotel 如Ctrip, 算合資格簽賬嗎？Many thanks! 小斯, 我已經有渣打asia mile, bea world master, bds black master, hsbc plantium card, 仲有咩卡可以申請賺盡miles/avios迎新? 打算開CITI, CITI邊張好? 最近CITI有咩正既迎新? 如果冇, 打算再遲下先開..
有冇比較過海外/外幣消費, 大新 VS 渣打ASIA MILES卡邊個匯率計番港幣邊個低D? 小斯,我打去大新問autopay 有冇分,佢地答有,但你話無. 可以double confirm 下嗎? Hello Siu C, may I know where does Dah Sing Bank say that we are entitle to double avios on birthday? I couldn’t find it anywhere on their website…both BA card section and birthday section. If there is no double avios then I don’t need to rush paying everything on my birthday. Could you please advice? Thanks. So 6K avios from welcome offer does not include the basic avios? I think there is 1.5k basic avios and then since I pay on birthday, this 1.5k become 3k and resulted in 7.5k? 如果我無錯, Qantas 應該都係One World ! 但好奇怪, 我上英航個網search 澳洲內陸機, SYD > HBA or MEL>HBA 但英航話無呢班機, 何解 ? 但Qantas 係有呢條route ! thx ! 唔係喎 ! 如果無位， 佢係”Sorry, there is no flights avaliable on xxxx” ! 但 e 家係 ” BA and its partners do not fly this flight” 喎 ! 咁樣係唔係唔畀換 ? 麻煩 小斯大人 的解答 , thanks ! Hello, 有見你之前答網上交保費都計迎新. 想問埋生日嗰日網上交保費都會$3 = 1 Avios? 因有好幾千蚊,兩樣都食到的話真係好抵!! 呢兩日試過加入Executive Club, 填哂資料都佢冇彈有咩未填過唔到. 但係咁click “Join Now” 都冇反應……. May I ask if tax bill and other electricity bills be consider as valid transaction for welcome miles? 小斯你好, 想問下如果經apple online 買gift card 係咪都可以儲到分換Avios 架? Thanks! 想ask ask … what if I get my relative to apply? then I get a supplementary card? Could my relative then get all the bonus points from my supplementary card spending? 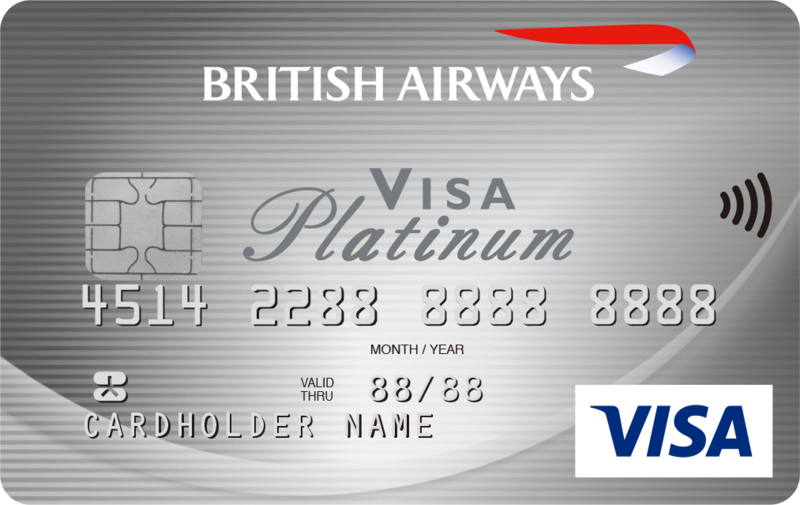 Then can my relative redeem air tickets for me using the points from his BA account? Sorry I know it’s a bit complicated but I am angry at myself for getting the ANA card just before Xmas!! Could my relative then get all the bonus points from my supplementary card spending? 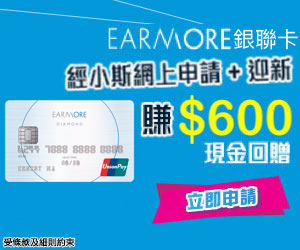 有冇得 THROUGH 你申請, 再拎 COUPON? 迎新優惠：5月15日前申請，新客戶批卡後頭2個月簽滿$6,000，就有額外4,000 Avios；簽夠$9,000，就有6,000 Avios (八達通自動轉賬 / 網上繳費，即係交稅都計簽賬要求) <– that means 包網上交保險?? btw o個陣申請左O個 D 再 CUT 卡, 而家再申請係咪都有迎新? SIU C, 想問下 avios 係咪要keep 住用先唔會cancel 我d分? 我同老公每年只會去一次2星期旅行, 跟你學嘢後已將所有積分換晒AVIOS. 本身最唔鐘意坐CX, 老公每月簽帳又少, AVIOS 既FAMILY PLAN 換機票啱晒我地. 咁依家我係咪應該出呢張無迎新既大新BA咭長用呢? $6/1哩都剎…. 定係AM 及AVIOS 兩邊都儲?? 我們每年只會去一次2星期旅行, 最不喜歡搭CX, 跟你學嘢後開始把所有積分換AVIOS, 因老公每月簽帳不多, 最鐘意AVIOS 既FAMILY PLAN 可用我D分換晒兩公婆免費機票 =). 最近很多新咭都送ASIAN MILES, 但如果我主力換AVIOS, 是否應該專心D用呢張大新AVIOS咭? 剛過完冷河, 但佢好似已經無咗迎新優惠…. 想問問點解我係BA個網, 搵香港飛其他地方, 好多時會出ERROR 既 ? 小斯, 請問如果平時唔多簽卡, 但甘岩有一筆大數(幾千蚊)將要簽, 而又就黎生日, 你會建議邊個做法? Thanks! 但有朋友岩先同我講話問過watson’s, 佢地吾當sale簽脹, 會當”繳費”, 然後就無分, 系咪真架?? 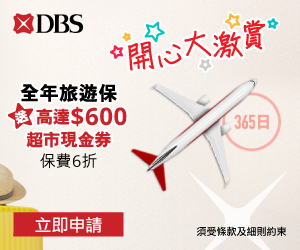 因為渣打AE一申請碌8000蚊有8000 asia miles, 交通銀行碌4000蚊有5000 asia miles, 咁應唔應該順便儲下asia miles呢? 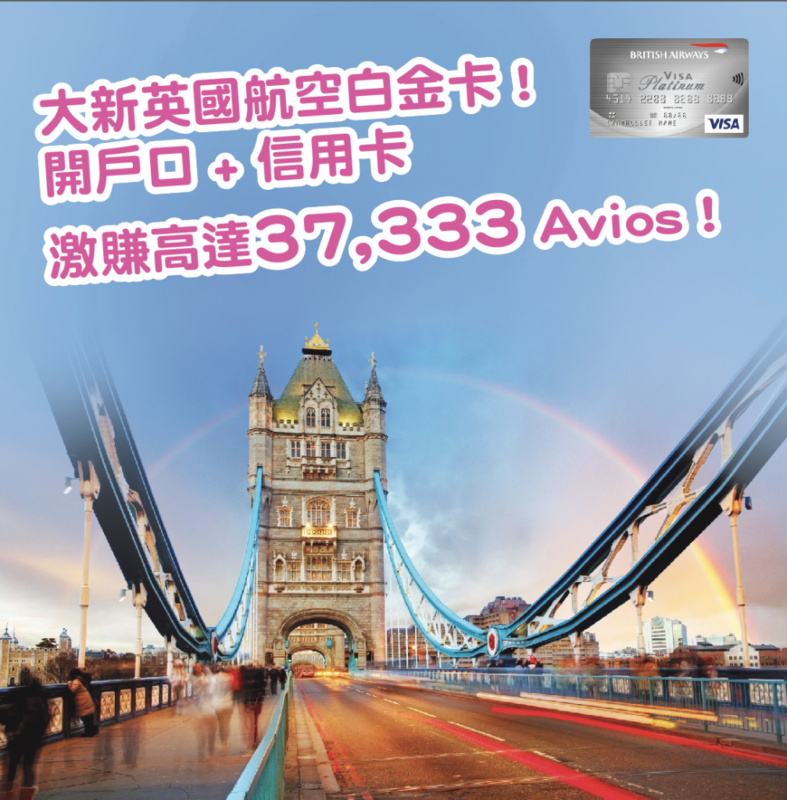 如果呢$12000我碌大新會有2000 avios, 但asia miles就有13000. 同埋呢, 我有見到avios去美國好似70000里, asia miles要90000? 因為都未去過美國, 都會有興趣, 如果咁儲會唔會好D? 我見富邦個網寫, 鈦金master果張卡要喺2015年2月28號之前換晒D asia miless… 以你嘅經驗佢會出年會唔會有新計劃continue? 唔係嘅話我都儲唔到好耐…. 想問下: 積分有效期： 即時於月尾轉換成 Avios 即係點?? = 無限期ma??? 我一直都只係死谷ASIA MILES, 唔知道原來大新英航換去台灣同日本都平過ASIA MILES, 笨左咁耐, 真係好彩睇到你個BLOG咋!!! 我平時每年出外兩次, 農曆新年會去台灣, 暑假會去日本或者東南亞. 如果係東南亞的話, 邊張卡最抵? 同樣去日本, 點解AM要3萬里, 英航只需要2萬里? 呢D唔係計飛行距離大家都一樣既咩? 另外我每次用ASIA MILES換機票都係換兩張, 因為我將我老公加入左我既redemption group. 英航是否都可以咁樣做? 如果英航可以換國泰機票, 咁asia miles可否換英航機票, 但係就用英航既標準? 即係用2萬asia miles去換英航去日本既機票? 水電費呢.? 因BA咭自動轉賬無分, 但我又想儲AVIOS, 但又無HSBC, 咁點算呀?? HEY 小斯我剛收到電郵, 來自Executive Club, 講以全新卡戶申請大新英航卡, 有迎新6000里送, 第一筆交易後就有. 其實有點混淆，去澳洲唔係儲mileage plus大新聯合航空好D咩？(我睇UA post 寫的）唔好誤會……不是想challenge, 只想弄清楚再申請……Thanks! 唔係呀, 英航D分可以換晒所有one world既機, 而且仲平過asia miles添! 唉 唔批 年薪差少少 冇諗過咁唔手鬆T^T 唯有儲聯合…. 我的消費習慣: 基本上唔使網上繳費 (除左交稅), 保險經HSBC買, 所以用返佢張卡, 每月做AUTO PAY. 恆生有份年繳既PLAN, 用佢張卡找數賺CASH DOLLAR. 有時會網上購物, 本地和外國網站都有. 八達通自動增值同交電話費 (3HK) 用COMPASS VISA , 甚少去超市/WASTONS & 萬寧. 飲食簽帳不多, 本地簽帳多數係買衫, 美容類或幫公司繳費, 買野, 網上訂野. 幫公司買野就係WEEKDAY, 自己的簽帳多數係WEEKEND.